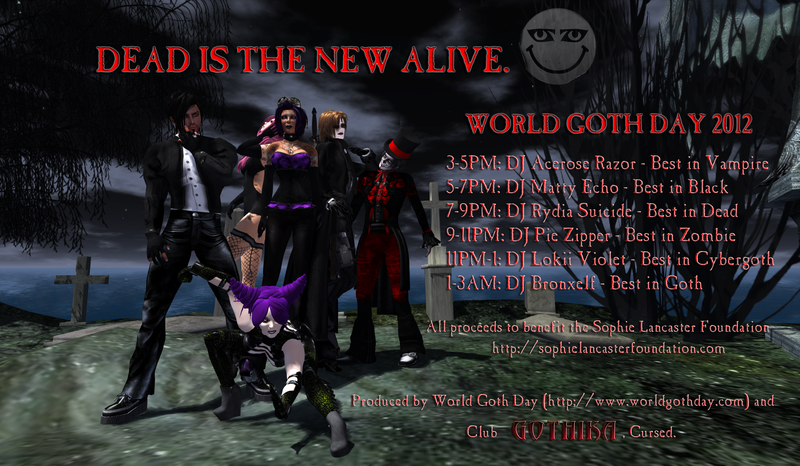 World Goth Day was started by a couple of guys (Cruel Britannia and Martin Oldgoth) in the UK in 2009. It’s since spread all across the globe, with events scheduled for May 22, a day where everyone can get their goth on and have a great time doing it. But since every day is goth day for us, we figured just one day just wasn’t going to cut it. So we decided to take the whole month of May (see how we are? 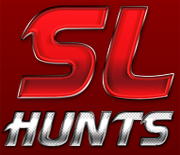 ), filling it with all kinds of dark and gloomy fun for goths of all flavors. And so it has begun, so it shall be. I usually try to participate in a few charity events every year; something that is either close to home in experience, or something that is genuine in the world trying to make a difference. 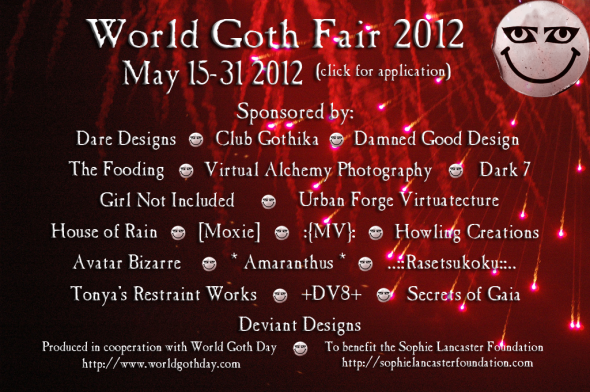 WGF has hit on two levels, making a difference, and being probably one of – if not the biggest Goth and alternative spooky event on the grid. For those not familiar with it – the culmination of all these talented designers and many many more will be going towards the Sophie Lancaster Foundation (which more info can be found at the official website here) This is just the start of it. 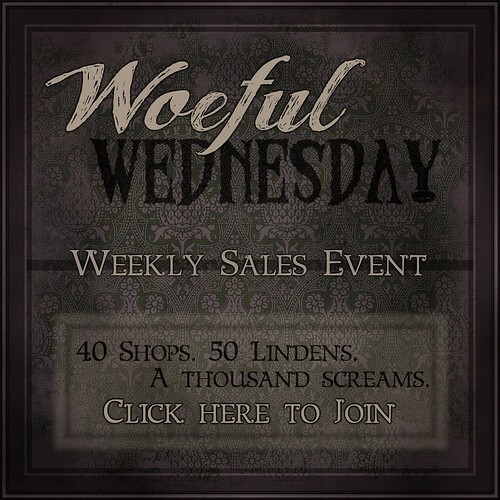 We literally took over the whole month in celebration of this, starting with the Nightstalker Hunt that’ll be the entire month of May (1st-31st) with a wide assortment of goth, spooky, alternative, victorian, glam-goth, industrial and more flavors just to get the palette into gear. So come out for a month long event of sheer magnitude of everything dark and sticky, and everything that goes bump in the night. For they gave us one day, and we took the whole month.